Although I’ve lived in Paris half my life (which is a respectable number of years, said she, coyly), and I’ve seen pretty much every museum there is in the City of Light, there are some historic places I haven’t visited yet. Balzac’s home and the studio of painter Delacroix, for instance. The sewer system, by olfactory choice, although I have toured the catacombs. The Gobelins Tapestry and the Sèvre Porcelain Manufactories, even though I’ve seen many of the treasures they’ve produced over the centuries in museums and castles - and homes! - across France. One place I’d never ventured out to is the Château de Vincennes. After all, it’s outside Paris, all the way at the end of the Métro line. Which is no excuse because Vincennes shares a border with the 12th arrondissement of Paris, and the steps up from the Métro deliver you directly to the drawbridge of the castle. That wrong has now been righted. Twice. In May, on a delightfully warm blue-sky day, a visiting friend from Ann Arbor and I went out to see what there was to see. But as it wasn’t a Sunday, we could visit just the ground and first floors; the rest is only visitable on Sundays at 11 am, and you need a reservation. Now it’s November and I’ve made one, safe in the meteorological reassurance that Sunday would be as nice as Saturday. Which it definitely was not, thanks to thick fog. So now I’ve been up to the top and I’ve seen... pretty much nothing except the immediate castle complex below and the man-made “Mountain” poking up through misty trees at the Zoo nearby. No Notre-Dame. No Eiffel Tower. No Sacré-Coeur. It was definitely a case of Murphy’s Law: All things being equal, you lose. The visit of this castle won’t mean much to those who don’t know French history and to whom King Saint Louis sitting under his oak tree, meting out justice to his people, rings no bells. Luckily for me, a lot has sunk in during my years here. Especially the part about King Charles V. (He and I once crossed paths on a daily basis, given that the building of the Université de Paris where I studied was Institut Charles V on rue Charles V in the Marais.) And Charles V is the person we have most to thank for this vestige of the Middle Ages. Initially a hunting manor in a Forest of Vincennes five times larger than it now is - and it’s still very large - the castle became necessary when the last of the Capetian kings died and the French crown was up for grabs. One of the contenders was Edward III, king of England. But the French, refusing to be ruled by an English king, decreed that it was illegal to inherit a crown through the maternal side of your family (a Salic law that still holds today although there is no longer a monarch). That led to the Hundred Years War. And thus the need for castles that would protect the crowned head of France. The dungeon at Vincennes is the tallest in Europe, say the documents. It was built in record time in the mid-14th century. But an invading enemy king and army are a powerful incentive, I guess. Although attacked and besieged, the dungeon has never been taken. The walls are 3 meters thick. That’s almost 10 feet. And those walls, along with the floors and ceilings, contain something that wasn't used again for centuries: iron reinforcement (clad in lead for good measure). But to be functional as a residence, doors were needed in those walls, making them less strong, so a central column was added, along with arches to distribute the weight of the floors above. Vincennes is also the only remaining residence of a king of France, and it includes all the accouterments. A deep well on the ground floor supplied not only the kitchens on this level for food preparation and cleaning, but also water for the entire building in case of siege, which happened several times in the Middle Ages and up to Napoleon Bonaparte. The next level up is the council room, with a large fireplace on the north wall and carvings on the consoles of the arches. As the king of France ruled “by the will of God”, those carvings have a Biblical theme that blends four of the Old Testament prophets - possibly Jeremiah, Ezekiel, Isaiah and Daniel - with the four Evangelists of the New Testament - Matthew, Mark, Luke and John. you enter the king’s bedroom. To keep the huge room toasty warm, at least by medieval standards, an equally huge fireplace graces the west wall. Normally this fireplace should be above the one in the council room, but it isn’t. And there’s an ingenious reason for that: the fireplace downstairs is directly under the king’s bed, which means the flue in the wall heated him at night. Although the decoration on the hood of this majestic fireplace is barely visible, on the central ribs of the ceiling arches the original paint is much clearer. There’s a reason for that too: what the colors were made of. The yellow is gold leaf, the blue is crushed lapis lazuli and the red, crushed rubies, no less. After all, France was the richest and most populous country in Europe at that time so regal interior decoration had to rise to the occasion. Spare the expense. One more flight up are quarters intended for the dauphin, the crown prince, but never used by him. Above that, the guard’s room, with sand on the floor and wooden ceiling. Above that, the battlements - where the splendid view is supposed to be but isn’t. Above that? Only God. As of the 16th century, the king went elsewhere and the dungeon took on a second life as a prison. In the small tower rooms, one at each corner, including those used previously as a chapel or a study, prisoners were kept. Famous prisoners, chronologically including future king Henri IV the Protestant - although it was said it was for his own protection - and later the Sun King’s light-fingered Finance Minister Nicolas Fouquet, and later still the infamous Marquis de Sade. Some, being nobles, had their cells decorated with paintings that are still visible. Others just settled for scratching their names into the walls, including one poor Sergeant Dupin in 1850, a political prisoner who visibly wanted all to know the details of his detention. After a dizzying descent in the corkscrew stairway, fresh air is what’s needed. You can take a walk over to the Chapel, fashioned after the Sainte-Chapelle on the Ile de la Cité. Started by Charles V, it remained in a truncated version until completed almost two centuries later. Sometimes exhibits are held inside; in May it was a vast collection of posters from the World War I era, including some xenophobic ones that reflected France’s hatred of Germany. This time the chapel is empty. But all of a sudden I hear the sound of horse hooves. I come out just in time to see armored knights and fair ladies passing by. Christmas just weeks off and on some week-ends the old castle is alive with jousting and falconry, jugglers, fire-eaters and other medieval things. Plus le Père Noël, aka Santa Claus. A way to tie together eight centuries of history. In spite of the fog. My thanks to Rémi Perrenoud, the wonderful guide who brought the castle to life with his vivid descriptions, and who lamented with me the total lack of visibility from the much-touted battlements. I promised him I'd go back when there was something to see... or rather the ability to see it. There were many things that surprised and amazed me when I moved to Paris. Many had to do with cooking and eating. Lunches were long, and they were the biggest meal of the day. That has changed because French lunch breaks are no longer two hours long. Except for business lunches. The table was - and still is - set differently, with the spoon all alone at the top of the plate and the fork turned over on its tines. Lettuce was never cut; you had to learn to fold it into bite-sized parcels using your knife and fork, which is a real challenge, on a par with learning to use chopsticks. Americans think of asparagus as a thin green vegetable. That’s because a) it’s a different variety and b) it’s grown above ground, allowing it to produce the chlorophyll that makes the green color. 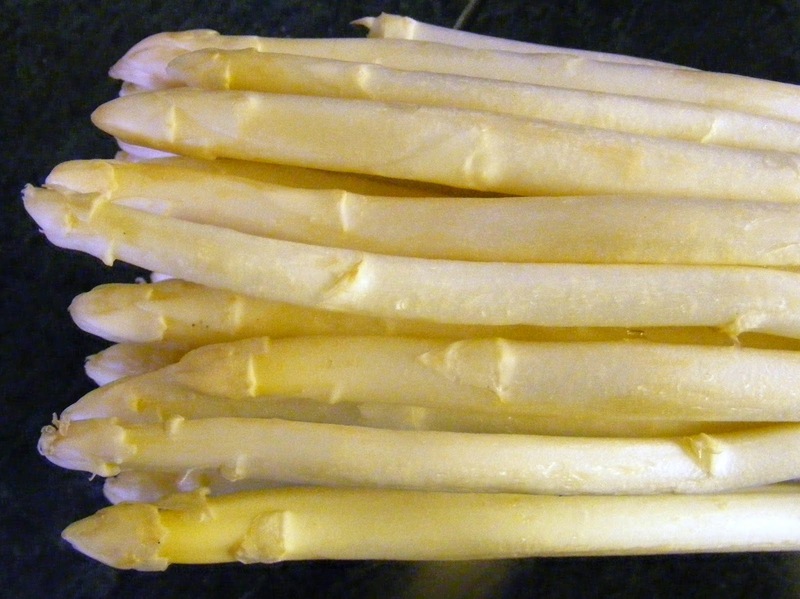 French asparagus was traditionally grown in rows of mounded earth, never seeing the sun until it was harvested. That makes it not only white, but much more tender. And the taste is less bitter. Lately green asparagus has made great inroads, maybe because it's more labor-friendly, but that's only a hypothesis on my part. Maybe it's just a fad. Or maybe the green type can be harvested faster. Both are delicious. I prefer my green asparagus in cooked dishes or else grilled over charcoal and then served warm with only a dribble of balsamic vinegar. But white asparagus can’t be beat as an appetizer. Or in a soup. As May is a good month for fresh asparagus, here’s a recipe that’s easy and fast to make. Plus it leaves you with asparagus tips to use in another dish! - Cut off the tough end of the asparagus stems and peel off the hard outer layer of skin. - Melt the butter, but don’t let it brown. - Dice the shallots and sweat them until they’re translucent. - Meanwhile, boil the asparagus stems for 3-4 minutes. Remove them from the water, but don’t throw the water out. - Add the flour to the shallots, stir and lower the heat. Simmer for 1 min. - Pour in 3 c of the water used to cook the asparagus. - Add the milk and salt and bring to a boil, then let simmer for 15 min. - Remove any cartilage from the crab. - Mix the asparagus and the liquid in a blender, then strain. - Stir in the crème fraîche and pour into individual bowls. - Decorate with the crab and cilantro. Crème fraîche isn’t always handy, and when it is, it can be pricy. According to Julia Child, French cream has a butterfat content of 30%, which makes it comparable to American whipping cream. “If it is allowed to thicken with a little buttermilk, it will taste quite a bit like French cream, can be boiled without curdling, and will keep for 10 days or more under refrigeration.” By “a little buttermilk”, Julia means 1 T of buttermilk for 1 c of whipping cream. You just heat it a bit, NOT to boiling by any means, pour it into a partially-covered jar and let stand for a few hours. Then stir and refrigerate.